This swap will be for 2 sticker bags per partner. You will have 3 partners. Please do not send more than one homer per partner. Please make sure that the sticker bags do not have reward, alphabet, or numbers in them. Everyone would like a variety of great stickers. No less than a 5 rating. Newbies are welcome with a very detailed profile. Needs to be where I have to scroll down to read. I will be selective so please follow instructions.I will angel if need be. I have had to angel many swaps lately, and it is only responsible to send out on time and what you would like to receive. what is a "homer" please? 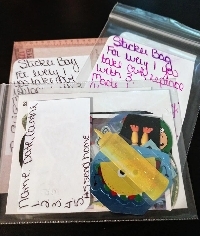 @goosey a sticker bag that needs only one more signer to be returned to its original owner. Can they be stickers I've made? Or do they have to be scrapbook stickers?